reading this manual, keep it in a safe place for future reference. One Canon Plaza, Lake Success NY 11042, U.S.A.
NMB-003 édictée par l’Industrie Canada. Model DR-2050C is identical to model M11055. Model DR-2050C is the sales name of model M11055. Model DR-2050SP is identical to model M11060. Model DR-2050SP is the sales name of model M11060. SEALED DISK PACKAGE, YOU ARE DEEMED TO AGREE TO BE BOUND BY THIS AGREEMENT. ITEMS TO THE PLACE WHERE YOU OBTAINED THEM FOR A REFUND BEFORE THEY ARE USED OR OPENED OR UNPACKED. In consideration of the right to use the SOFTWARE, you agree to abide by the terms and conditions of this Agreement. shall need to obtain multiple licenses separately from Canon when you shall install the SOFTWARE on multiple computers. convert to another programming language the SOFTWARE or accompanying documentation, except as expressly provided herein. the SOFTWARE or accompanying documentation and you also shall not have any third party do so. the SOFTWARE. No updates, fixes or support will be made available for the SOFTWARE. WHATSOEVER CAUSED BY OR ARISING OUT OF THE SOFTWARE, ACCOMPANYING DOCUMENTATION OR THE USE THEREOF. DOCUMENTATION OR THE USE THEREOF INFRINGES ANY INTELLECTUAL PROPERTY OF SUCH THIRD PARTY. of this Agreement. In addition to Canon enforcing its respective legal rights, you must then promptly destroy the SOFTWARE and any copy thereof. Should you have any questions concerning this Agreement, or if you desire to contact Canon for any reason, please write to Canon’s local affiliate. machine meets the ENERGY STAR® Program guidelines for energy efficiency. equipment, such as computers, monitors, printers, fax, machine, copiers, and scanners. or registered trademarks in other countries. • ISIS is a trademark of EMC Corporation, in the United States. • Intel and Pentium are registered trademarks of Intel Corporation. • ENERGY STAR® is a U.S. registered mark. • Adobe is the registered trademark of Adobe Systems Incorporated in the United States and/or other countries. • Adaptec is registered trademark of Adaptec Inc.
• Other product and company names herein may be the trademarks of their respective owners. Copyright 2006 by CANON ELECTRONICS INC. All rights reserved. without the prior written permission of CANON ELECTRONICS INC. THE USE OF THIS MATERIAL. functions. After reading this manual, store it in a safe place for future reference. computer, and project scanned images onto a screen. 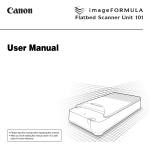 start using the scanner, be sure to read this User’s Guide. through to setting up the scanner for scanning. safely, always pay attention to these warnings. use the machine safely, always pay attention to these cautions. documents to the front of the scanner. curtains to shade the scanner. • Avoid locations where a considerable amount of dust accumulates. ammonia, paint thinner, or other volatile chemicals may be present. • Avoid locations where ammonia gas is emitted. • Avoid locations that are subject to vibration. (e.g. speakers, televisions, or radios). the extension cord is rated for the current requirements of the scanner. • Do not use the power cord while it is coiled. grasp the plug and remove it from the outlet. can be disconnected easily in an emergency. adapter provided with the scanner with any other electrical devices. authorized Canon dealer or service representative for further information. it. The scanner weighs approximately 5.5 lb (2.5 kg). • Do not disassemble the remote control. • Take care not to misplace the remote control. • Do not drop or cause physical shock to the remote control. • Do not use any remote control other than the one provided with the scanner. Also, do not use the remote control with any other product. • When replacing the remote control batteries, replace both batteries together. • Insert the positive (+) and negative (-) poles of the batteries correctly. • Do not combine old and new batteries, or batteries of different types. • Do not use Ni-Cd or Ni-MH batteries. Note the following precautions whenever using the scanner. Failure to do so may result in a fire or electric shock. other highly flammable substance near the scanner. not pull or excessively bend the power cord. • Never connect the power cord when your hands are wet. • Do not connect the scanner to a multi plug power strip. cord and AC adapter provided with this scanner. • Never try to take the scanner apart or modify it in any way. this is dangerous and may lead to a fire or electric shock. • Do not use flammable aerosol sprays products near the scanner. or any other flammable substances. scanner to overheat, creating a risk of fire. might cause fire or electric shock. or fall over, resulting in personal injury. power source meets the power requirements of the unit. you will be unable to unplug it in an emergency. dealer or the service representative for further information. • Do not drop the scanner, or subject it to impact or strong shock. or service representative to have the unit serviced. OFF, and disconnect the power plug from the power outlet. period of time, such as during consecutive holidays. power cord to stop the scanner. laws or consult with the retailer who sold you the scanner. when disposing of batteries used for the remote control. The scanner has a very compact configuration, measuring only 11.7"
footprint of this standup vertical scanner saves space. Connect the scanner to a computer with Hi-Speed USB 2.0 protocol. Documents can be scanned in 24-bit color or 256-level grayscale. corrected so that it is aligned as straight. background of the document is dark or the text is written lightly in pencil. read if the background and text are similar colors are both light colors. * May not function well depending on the document. specify a color for the scanner to omit from scanned images. initiates scanning when a document is placed in the document feed tray. The scanner is able to scan carbonless duplicating paper. see the DR-2050SP User’s Guide Presentation Mode Edition. the scanner. For part names and their functions of the DR-2050SP, see the DR2050SP User’s Guide Presentation Mode Edition. Open when you need to set a document in the scanner. without separating them, raise the lever (Bypass mode). the width of the document. is provided with the scanner. openings can cause internal heat build up, creating the risk of fire. - Monitor: Resolution of 1024 × 768 (XGA) or better recommended. compatible with the above operating systems. • Use the most recent version of the USB 2.0 driver provided by Microsoft. USB Full-Speed (equal to USB 1.1). transmission may take a long time. speed may vary, depending on the scan settings. ISIS-compatible application developed for Canon document scanners. The following shows how the DR-2050 series setup disc is configured. * All of the indicated software is installed. Guide” provided with the scanner. of paper at one time can cause the scanner to jam. • Always make sure that the ink on a document is dry before scanning it. glass, cause lines or smudges to appear on images, or dirty other documents. in the scanning conditions before scanning the document. and then scan the photocopy. Prepare the document feed tray in accordance with the document size and type. Pull the document feed tray towards you to open it. on the document guide to keep the document from becoming skewed. document in the scanner, and then pull out the feed extension Plate. document, or cause a paper jam or scanner malfunction. immediately disconnect the power cord to stop scanning. 1. Lower the feed selection lever (Page Separation mode). 2. Adjust the document guide to the width of the document being scanned. can damage the document tray. edges of the paper can unexpectedly cut your hands. and its top edge facing downwards. that the capacity is less when document pages are not being fed correctly. 5. Adjust the document guides so they match the width of the document. 6. Start scanning from the application. to prevent damage to the scanner while it is not being used. 1. Raise the feed selection lever (Bypass mode). 3. Start scanning from the application. The document is scanned as it is detected. the edge that is fastened together as the leading edge. document are scanned and combined into a single image. above) and attach the document guide adapter to keep the document straight. non-standard size documents, set “Page size” to [Auto-detection]. documents that have text or photos that go across the fold. guides are too wide the document may skew or images may be misaligned. • Documents that are folded in half cannot be scanned when using the DR2050SP in the Presentation mode. from the scan menu to perform scanning. file is saved to the specified folder. image is printed on the specified printer. (Scan JOB) on the toolbar (b). conference halls, where it can be connected to large displays or projectors. scanned, and the scanned image is displayed at full size on the screen. and the procedure up to scanning with Scan Batch to File. For details, see the CapturePerfect Operation Guide and CapturePerfect Help. for Windows XP) Æ [CapturePerfect 3.0] Æ [CapturePerfect 3.0]. The following two jobs are already registered as scan jobs. [My Pictures] in the My Documents folder. in [My Pictures] in the My Documents folder. as the scanner to be used. 1. On the [Scan] menu, click [Select Scanner]. 3. Set the “Default Page Size”. 3. On the [Scan] menu, click [Scanner Setting]. Driver basic setup dialog box opens. 2. Select [CANON DR-2050C] Æ click the [OK] button. 4. Set the scan settings. 6. On the [Scan] menu, select [Scan Batch to File]. The [Scan Batch to File Setting] dialog box opens. box, see the CapturePerfect Operation Guide and CapturePerfect Help. scanning], and to stop scanning, click [Stop scanning]. the scanner according to the Windows event function and job tools. the [Job] button by the Job Registration Tool. Select and register one of the following four functions to the [Scan] button. files are saved to a specified folder. files are output on a specified printer. software is started up, and scanned images are attached to a new e-mail. using Windows XP) Æ [Canon DR-2050C] Æ [Job Registration Tool]. The Job Registration Tool starts up. colored is executed when the scan button is pressed. 2. Set up the Job Registration Tool. Tool Settings” (See p. 54.) and the Job Registration Tool Help. • You can register jobs for numbers 1 through 10.
) in the No. frame. The job with the colored icon is executed when the scan button is pressed. 4. Click [Close] to close the [Job Registration Tool]. 6. Press the [Scan] button. “Monitor for DR2050C” is displayed and the scan is executed. according to the specified conditions. [Launcher] is selected in Job Registration Tool. 1. Use the following procedure to open the [Event settings] dialog box. [Printers and Other Hardware] in the working field. 3. Click [Scanners and Cameras]. 4. 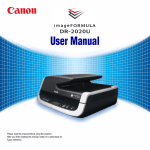 Select [CANON DR-2050C USB], and then click [Properties]. 5. Click the [Events] tab. 2. Select [Scan] button from the [Scanner events] drop-down list. 4. 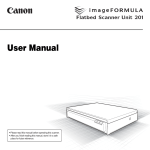 Click [OK] to close [CANON DR-2050C USB Properties]. 5. Restart Windows to enable the new settings for the event function. [Job Tools] dialog box is selected, and the [Scan] button is clicked. • Certain applications may not run normally when started as an event. • To disable use of events, mark the [Disable device events] checkbox. the edges of the paper. 1. Remove any documents from the document feed tray. 3. Remove the jammed document from the feed side or the output side. until you hear a click. document was scanned correctly, and then continue scanning. This section describes helpful hints for setting up and using your scanner. on items not described in this section, see “Software Settings,” on p. 49. • I want to scan a double-sided document. Set Scanning Side to [Duplex]. the document is automatically detected. A non-standard document size can be registered as a Custom Paper Size. area cannot be specified when “Page Size” is set to [Auto-detection]. Set the “Feeding Option” in the Scanner Settings to [Automatic Feeding]. can continue scanning batches until your job is complete. you need to align the edges of the document after it has been placed. is loaded, the scanner starts scanning when it detects the next document. loaded, the scanner starts scanning when the Scan button is pressed. • I want to skip blank sheets contained in a document stack. performed, and blank pages are skipped. • Blank sheets are not skipped even if [Skip blank page] is set. Set a higher [Ratio of black pixels] value (adjust the slider towards the right). skipped due to the background color or dirt on the document. • Documents full of text are skipped as blank sheets. Set a lower [Ratio of black pixels] value (adjust the slider towards the left). sometimes skipped as blank sheets. When a blank sheet is not skipped, adjust the slider to the right. When a text document is skipped, adjust the slider to the right. removed to enhance the text. is eliminated or processed out of the document and the text is enhanced. smoothing colors]. This averages the image to suppress moire. Specify the color to skip during scanning in [Color drop-out]. Select [Red Enhance] at Dropout Color. Adjust the [Edge emphasis] setting. Check the [Border Removal] checkbox. See “TWAIN Driver Settings s,” on p. 52. See “ISIS Driver Settings k,” on p. 50. For the TWAIN driver, check the [Prescan] checkbox and click [Preview]. One sheet of the document is scanned, and the Prescan window is displayed. the conditions you set overwrite the settings of the selected user preference. performed by selecting the job and then executing the scan job. keep it near the scanner as a reference. Help files for each item. * Area setting is not available when the [Auto-detection] Page Size is selected. * Scanning of the specified area may be shifted when Deskew is enabled. Name and save your settings.
) Names can consist of up to 32 characters. enhanced and easier to read. dpi] Dots per inch or below is selected. Selects the size of the pages to be scanned. Adjusts brightness of scanned images. Text Enhanced mode is selected. Adjusts contrast of scanned images. Specifies the side of the document to scan. displayed are combined into one image. For details, refer to the user’s guide. Selects the document feeding method. after pressing the scanner’s scan button. the scanned image is straightened. displayed in the Prescan window. document size as a custom page size. Specifies the area to be scanned.
) These settings are disabled when [Autodetection] is selected for the Page Size. the current Page Size setting. adjusted by dragging the mouse. front or back of documents. Enhances contours in scanned images. dpi] Dots per inch is selected. window] is displayed in the Scan Area dialog box. ejected, the next page is scanned. [Simplex], and only one page is scanned. settings. Click the Help button for details. executed when the scan button is pressed. Opens the New/Editing dialog box. Copies a registered job to another Job No. Deletes the selected job from the Job list. Opens the Admin dialog box. are determined by the selected function. dialog box to configure the scanner. a time stamp to the specified file name. Selects the file format for saved images. PDF or TIFF is selected. PDF or TIFF Setting dialog box. Opens the Access setting dialog box. to obtain access to a shared network folder. they are printed at actual size. settings for the TWAIN driver. corresponding to the number of pages. the pages as one file. and the capacity of that folder, in advance. and the scan progress is displayed. Backs up and restores registered jobs. Removing and Attaching the Feed Roller ..
exterior of the scanner, or create a risk of fire or electric shock. exterior of the scanner to clean it. Dust or paper particles inside the scanner can cause lines in scanned images. and then clean any paper particles that are remaining. are dirty, then the scanning glass or the rollers inside the scanner may be dirty. 1. Open the document feed tray. 3. Use a blower to keep the interior of the scanner free of dust and paper particles. 4. Use a clean dry cloth to wipe dirt off the scanning glass. Wipe both the top and bottom scanning glasses. local authorized Canon dealer or service representative. 7. Wipe the removed rollers with a firmly wrung cloth moistened with water. fully to its original position until you hear it click into place. 1. Turn on the scanner. 2. Open the document feed tray. damage precision mechanisms, such as the light source. roller when you clean or replace them. roller kit, and replace the feed roller and the retard roller. rollers. Doing so may damage them. necessary before the message is displayed. information about the exchange roller kit (feed roller and retard roller). 1. Follow the procedure below to open the [Counter setup] dialog box. 3. Select [CANON DR-2050C USB], and then click [Properties]. 4. Click the [Counter] tab. has been set to 0.
lever according to the removal procedure and then attach the feed roller. roller. Doing so may damage them. the cover and open it. 3. Raise the roller lock lever (a), and then slide it to the left (b). the roller with the scanner shaft. the left side of the roller. 4. Shift the feed roller to the left to separate it from the shaft, and then remove it. 3. Lower the lever to lock the roller shaft. hear it click into place. 1. Position the retard roller so the notch in the roller is facing the scanner’s shaft. the left side of the retard roller. pushing on both edges with both hands until you hear a click. scanner and how to solve them. your local authorized Canon dealer or your service representative. • Is the power cord connected correctly? • Is the power cord connected securely? • Is the power cord inserted into the power outlet? to Your PC,” in the Easy Start Guide. The following are possible causes of the PC failing to recognize the scanner. The scanner is not correctly connected. The scanner power is switched OFF. The scanner does not support your USB interface. The scanner does not support the USB cable. Use the USB cable provided with the scanner. The USB hub is not compatible with the scanner. The following problems might cause the scanning speed to be slow. Quit all other applications that are running. there is not enough free space on the hard disk. Hi-Speed USB 2.0 as standard. The USB cable does not support Hi-Speed USB 2.0. The USB hub does not support Hi-Speed USB 2.0. • Is the scanner correctly connected to the computer? • Has the scanner driver been installed? software been set up correctly? • Is there a problem in the PC system? running correctly. Re-install the scanner driver or application software. continues to occur, restart the computer. The following are possible causes when documents are not fed correctly. paper that cannot be scanned by the scanner. The rollers inside the scanner are dirty or worn. scanned sheet being engaged by the eject roller. that is engaged by the eject roller, or just start the next scan job. applications, the probable causes are as follows. cannot be opened by other applications. save the file in CapturePerfect 3.0.
file again in CapturePerfect 3.0. TWAIN driver settings or a problem with the scanning unit inside the scanner. Symptoms The scanned image is too dark (or faint). The [Brightness] setting is not set to an appropriate value. image is faint, set a lower [Brightness] setting. appear in the scanned image. The [Brightness] setting is too low, or the paper is too thin. copy of the documents and then scan the copy. Symptoms Double-sided scanning is not possible. “Scanning Side” is set to [Simplex]. Set “Scanning Side” to [Double-sided]. Symptoms A black margin appears around the scanned document. Symptoms The scanned image is skewed. Symptoms Lines, smudges, or dirt appear on the scanned image. Clean the scanning glass and rollers. Symptoms The scanned image is abnormal for certain documents. A function not supported by the application was used. information about the ISIS/TWAIN driver [Scanner Adjustment]. adjustment will cause previous adjustment data to be deleted. Once deleted, adjustment data cannot be recovered. Symptoms The scanned image is abnormal in some applications. are not operating normally, follow the procedure below to uninstall them. Then, re-install the software from the DR-2050 series setup disc. (See “Step 3. 1. Click the [Start] button Æ click [Settings] Æ [Control Panel]. For Windows XP, click the [Start] button Æ click [Control Panel]. The [Control Panel] window appears. 2. Double-click the [Add/Remove Programs]. If you are using Windows XP, double-click the [Add or Remove Programs]. The [Add/Remove Programs Properties] dialog box appears. For Windows XP, the [Add or Remove Programs] dialog box appears. See “Uninstalling the ISIS/TWAIN Driver/Job Registration Tool,” on p. 80. See “Uninstalling CapturePerfect 3.0,” on p. 82. 2. The [Confirm File Deletion] screen appears. Click the [Yes] button. The [Remove Shared File ?] dialog box appears. 3. Click the [Yes To All] button. 4. Click the [Yes] button to start the uninstallation. All deleted shared files can be reinstalled by installing the software again. 5. After uninstall is complete, click the [OK] button to exit the uninstaller. 2. The file delete confirmation screen appears. Click the [Yes] button. 3. After uninstallation is complete, click the [Finish] button to exit the uninstaller. Kit to replace the feed rollers (feed roller and retard roller). ONE CANON PLAZA, LAKE SUCCESS, N.Y. 11042, U.S.A.
703 WATERFORD WAY, SUITE 400 MIAMI, FLORIDA 33126, U.S.A.
19TH FLOOR, THE METROPOLIS TOWER, 10 METROPOLIS DRIVE, HUNGHOM, KOWLOON, HONG KONG. Keep this Quick Guide near the scanner for ready reference. ☞ Names can consist of up to 32 characters. size as a custom page size. text is enhanced and easier to read. when [400 dpi] Dots per inch or below is selected. White or Text Enhanced mode is selected. [Ratio of black pixels] value. areas (0 to 20%) when skipping blank pages. starting scanning from the application program. pressing the scanner's scan button. scanner detects a loaded document. [Automatic Feeding] Feeding Option is selected. Documents can be scanned as separate batches. is selected for the Page Size. details on this setting, click the Help button. Scanner” (see P.75) in the user’s guide. scanning is started by the scanner's scan button. only one page is scanned. reversed in the scanned image. This Quick Guide describes the TWAIN driver settings. Click the Help button for details. when the scan button is pressed. Enter the job title to appear on the display panel. Selects the function assigned to the Scan button. determined by the selected function. specify the destination folder for saving images. stamp to the specified file name. selected, and opens the PDF or TIFF Setting dialog box. obtain access to a shared network folder. changed by clicking the [Printer setting] button. Starts applications set with the Windows event function. See the user’s guide for detailed information. Selects [Normal] or [High Compression] rate. reduces the image quality slightly. and adds text data to the PDF file. is located in the PDF file. of the configured settings for the TWAIN driver. Selects the saving method for multiple page images. Compresses image files before saving them. are compressed as JPEG images. capacity of that folder, in advance. capacity is reached while scanning. displayed instructions to continue scanning. Registration Tool. Click the Help button for details. Service Manual PDF - Duvall Heating & Air Conditioning Inc.